The 1976 Australian team uniform at the Winter Olympic Games Opening and Closing Ceremony Uniform. This uniform was designed by the famous fashion designer Pru Acton OAM, in response to a request by athletes for a more colourful uniform than the standard green blazer hitherto worn by the Australian team at the Opening and Closing Ceremonies of the Games. The 1900 Kiandra ski together with the most senior volunteer and THS Vice President the living ski legend 1956 Australian Winter Olympian Frank Prihoda wearing his Olympic team blazer. 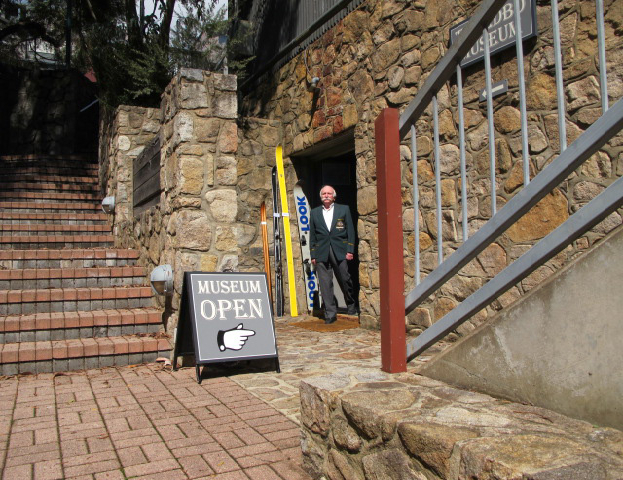 The Thredbo Ski Museum is operated by volunteers of the not for profit Thredbo Historical Society. It is centrally located in the Thredbo Village square and easily accessible by resort holiday makers, day tourists and bus groups. The museum displays a wide collection of historic items covering areas such as significant dates, geography, alpine pioneers, personalities, skis and alpine equipment, photos, clothing and fashion, films and books. It also has an expansive research library including a comprehensive set of Ski Year books. In addition to the permanent displays of the above items, the museum features changing exhibitions depicting the rich history of the development and progress of Australian alpine history, Thredbo Village and the NSW Alpine regions generally. The Society conducts annual social events with a historical theme in Thredbo and at RAHS History House in Sydney, for members and the public. Museum features include an early Kiandra ski, an Australian 1976 Winter Olympic uniform designed by Prue Acton and Laurie Seaman’s camera from his ill fated trip to Mt Kosciuzsko. Summer: Boxing Day to Australia Day daily. February - April, June and September: Weekends and public holidays. Winter: July & August: Daily except Mondays. CLOSED: May, October, November, Dec 01 - 26.